Playing with white pieces, Viswanathan Anand drew the first game of the 2014 World Chess Championship against 23-year-old defending champion Magnus Carlsen of Norway. 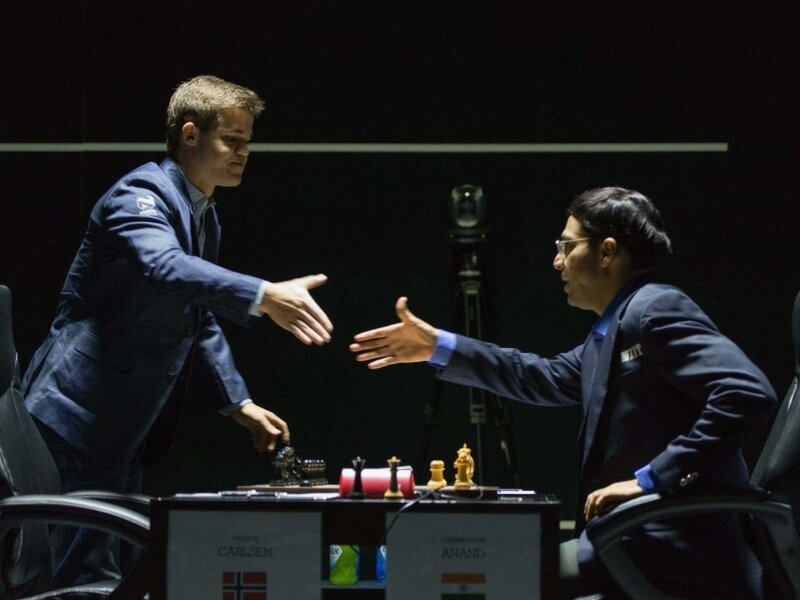 Indian ace Viswanathan Anand played out a fighting draw with defending champion Magnus Carlsen of Norway in the first game of the World Chess championship, here on Saturday. Having drawn the white pieces in the drawing of lots, Anand went for the blood on expected lines but Carlsen, after some initial problems in the Grunfeld defense came out with flying colours and gave the Tiger of Madras a tough time. With one of the preparations backfiring against an agile Magnus, it will be up to team Anand to look for remedial measures especially with white pieces as even though the Indian went up by almost 30 minutes on the clock in the opening phase. The advantage was gradually neutralised by Carlsen. Anand was, in fact, having less time than Carlsen when the game reached the first time control. It was a good opening for Anand as white in the topical exchange variation. The five times world champion apparently took a cue few from a couple of recent games played by Ragger Markus and Alexander Moiseenko and even though their final result were uninspiring, the position did offer the kind of volatility Anand was hoping to get. Carlsen, to his credit, was in his elements and showed no fatigue whatsoever when he was posed with a difficult positon to solve. While things seem to be favouring Anand thanks to his speed in executing his moves till move 13, the next one from Carlsen apparently took the Indian by a huge surprise as he spent no less than 23 minutes on it. Soon afterwards Anand embarked on a principled decision, one that dented his pawn structure for ever, but something that still gave him hope to fight for the initiative. However, as the game progressed it became clear that Carlsen had judged this one position better and slowly but surely, white's advantage - and hope - disappeared from the board. With the exchange of last minor piece on move 23, the players reached a perfectly equal but yet dynamic queen and rooks endgame. It was here that Anand lost his nerve towards the end of the first time control and what appeared to be a draw was suddenly menacing for the Indian. Carlsen did many things right from this juncture. The Norwegian gave nothing away to Anand and forced some passive display which led to a precarious, if not lost, position for the challenger. It all boiled down to a single move when on move 44, when given a chance, Anand had to find the perfect reposte without which his position would have only deteriorated further. As it turned out, Anand found the move in just over two minutes and thereafter things were in control. The game was drawn in 48 moves when Carlsen could not avoid perpetual checks.